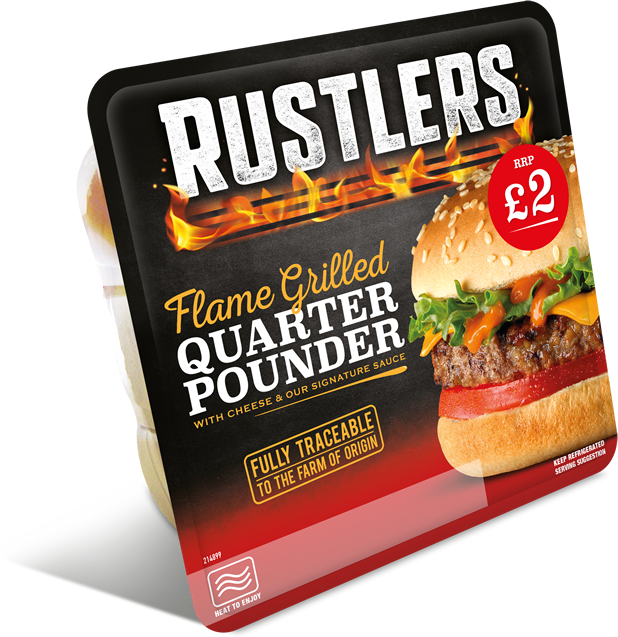 Flame-grilled Rustlers, the UK’s best-selling microwavable snack*1, is reinforcing its commitment to doubling sales in convenience by 2020 with category-boosting NPD that taps into the high street gourmet burger trend and eye-catching new packaging across the Rustlers range. The move is backed by a £2.5m consumer marketing spend and is drawing on key learnings from Rustlers’ biggest ever him! convenience retail study. In a first for the £118 million*1 microwavable snacks market, the NPD drive sees Rustlers introducing two ‘Gourmet’ flame-grilled burgers, both made with 100% beef, in a brioche bun. The Rustlers Gourmet range, packaged in a premium cardboard sleeve, comprises The Classic Burger (including cheese, streaky bacon, American-style mustard mayo and tomato relish) and The BBQ Burger (with cheese, streaky bacon, crispy onions and a smokey BBQ sauce). “Rustlers Gourmet burgers will attract new shoppers and build on the brand’s new ‘Great Taste, Great Beef, Always’ positioning, showcasing our unrivalled ability to provide a combination of great flame-grilled taste, high quality and quick-to-cook convenience,” says Adrian Lawlor, Kepak Convenience Foods’ Marketing and Business Development Director. 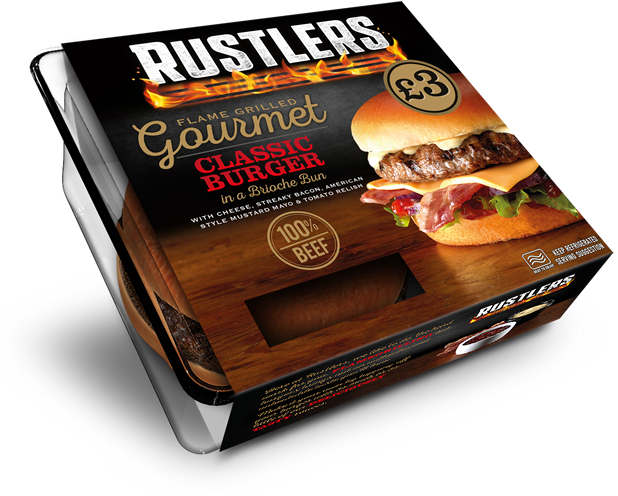 The Gourmet launch coincides with the introduction of new packaging across the Rustlers range. Eye-catching new pack designs feature a new Rustlers logo sitting over a grill with intense flames coming through, highlighting that every Rustlers burger is cooked by a unique flame-grilling process which delivers an authentic, smoky taste. “The new pack designs will be instrumental in dialling up Rustlers taste and quality credentials to people who have yet to try the brand,” adds Lawlor. “To help retailers capitalise on this opportunity, we are developing plans based on our bespoke piece of him! research to improve understanding of how our support package is perceived by convenience retailers and how it can be improved.